Chris Pratt and Chris Evans are going above and beyond the call of duty -- the duty of a bet they placed, that is. Despite the Super Bowl bet that involved visiting the winning actor's children's hospital of choice, the stars paid a visit to the 'losing' city as well. After making good on a Super Bowl wager that involved visiting the winning actor's children's hospital of choice, the stars have paid a visit to the losing city as well. 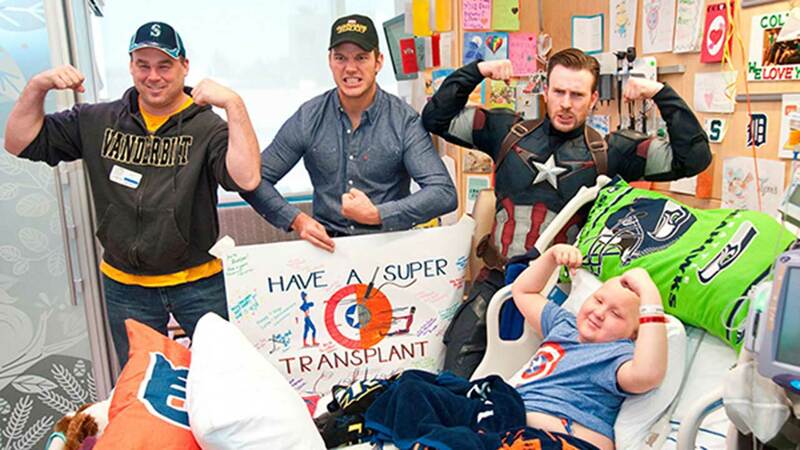 Chris Evans in his Captain America outfit wandered the halls of the Seattle Children's Hospital accompanied by his friend, Chris Pratt, letting patients play with the hero's shield. The visit came after a bet in which Evans -- a diehard Patriots fan -- agreed to show up in costume if his team lost to the Seattle Seahawks in the Super Bowl. Pratt, for his part, promised to come to Christopher's Haven, a Boston-area pediatric cancer center, if his team -- the Seawhawks -- lost, dressed as Star Lord, his "Guardians of the Galaxy" character. Evans' Patriots won the bet and the pair made their Christopher's Haven trip. The fun didn't stop there, though, as Evans promised on Twitter that Seattle Children's would be seeing Captain America in the near future. GREAT day at @chris_haven! You're my hero, @prattprattpratt. And look out @seattlechildren, you're next!! Over the weekend he fulfilled that promise, and the kids loved every minute of it, parents told the hospital. "We were so surprised," said the mother of Tyler, a 14-year-old patient being treated for leukemia. "It gave Tyler five minutes of happiness. This situation will never be normal, but their visit helped make us feel special." The bet helped raise more than $27,000 for Seattle Children's and Christopher's Haven, the Seattle Hospital said. Read more on the hospital's website. Photos used with permission of Seattle Children's.